We live in exciting and transformative times. And a strange paradox has also taken place in these interesting times, one that could grace any story as a great twist. Only it’s not fictional. It’s true. In the last 100 years or so, we’ve rejected many of the old religious dogmas as being irrational and unscientific. And we’ve been right in doing so. As part of our evolutionary journey we don’t need those things any more. The human mind has evolved to such an extent that in our present-day society we have all collectively become intelligent and discerning enough to make the superstitions and rituals of the past redundant. And in place of religion, we’ve adopted rational scientific thought and investigation as the way forward. And to a large extent we’ve also been right in doing so. It has served us well in making sense of the world around us and in developing technology to our benefit and convenience. But here’s the twist. In doing so, that technology – although providing us with a good deal of communication, transport and entertainment convenience and pleasure – has in many respects become inhibitory to the fulfilment of our deepest desire, the desire for inner peace and happiness. And in rejecting the religious dogmas of the past, science has created an even greater dogma by also rejecting the possibility of a higher consciousness (or “God”, hence the knee-jerk reaction) as being the very line of investigation that could afford us the greatest happiness. In essence, we’ve thrown the baby out with the bathwater. The cutting edge of progressive thought that we call modern science has seen fit to conclude that because we can’t perceive a greater consciousness with our senses or by scientific measurement, therefore it does not exist. Or at the very most that in order to accept it as existing, we must have proof of it. 1. That the universe appeared out of nothing, without any intention behind it, nor purpose or direction to it. That’s like expecting us to believe that our phones and laptops just fell into place without anyone designing them or putting them together. 2. That the essence of the universe is matter. The evidence is against this when we consider that most of matter is space anyway (99.99% of it) and that there is a huge gap in the calculated mass of the universe (based on the assumption that it’s all matter) and its actual mass, a gap which scientists try to fill by making up concepts like “dark matter” and “dark energy”. 3. That we are here by chance, and that there is nothing beyond death. There is strong evidence against this from past life studies, where children up to the age of about five remember previous lives, often citing details that have been verified by revisiting people and places they referred to; people and places they would otherwise have had no way of knowing about. Thousands of these cases meticulously documented by the late psychologist Ian Stevenson indicate that we have memories that cannot be solely stored in our brain; that they are part of a wider conscious experience spanning many lives; that consciousness transcends bodies and lives. This also points to a logical account (as opposed to a lottery draw) of the diversity of life on our planet and throughout the universe: that each and every mind is an evolving state of consciousness on a continuum of evolution; all at different stages; each adopting the most appropriate body to facilitate its expression and evolution. 4. That our minds and consciousness are only the product of the nerve impulses of our brains. This is refuted by the thousands of documented near-death experiences. One such experience is that of Dr Eben Alexander, a brain surgeon and neuroscientist who had, like many of his colleagues, bought into the idea that the brain creates its own consciousness. Then, quite ironically, he contracted a brain infection that put him in a coma for a week, during which he experienced a heightened and enlightened state of consciousness despite the fact that he was clinically brain dead at the time. These experiences are strong evidence that consciousness is not created by the nerve connections of the brain, and that ideas like eventually being able to construct robots and other forms of artificial intelligence with their own independent consciousness are little more than sci-fi fantasy. So let’s consider the possibility that, rather than consciousness being an entirely subjective experience dependent on the product of the nerve cells in our brains, it is the essential reality of the entire universe, within which everything exists, and that if we can connect to it, if we can feel it, then we can attain what we are all ultimately searching for. Up till now, though, we’ve gone the other way. We’ve been brainwashed into thinking that in order to be happy we need to accumulate more possessions, consume more products, be as comfortable as we possibly can, and experience as much physical and psychic pleasure as we can. But we all know by now that doesn’t work. Rather, it leads to a nihilistic outlook where we feel inadequate, selfish, insecure, alienated, lonely, fearful and depressed. I’m sure you can imagine, though, how rather than being instilled with these negative messages of materialism from childhood, the positive message of consciousness: of connectedness, love, hope, happiness and peace, could turn it all around. Instead of the bleak materialist worldview of which we have all been subjected to in one way or another, how about the worldview of an all-pervading blissful awareness inherent in everybody and everything? Of a greater consciousness as the essence of the entire universe, existing within everything and everything existing within it. Essentially, everybody and everything as part of — and full of — consciousness. But modern science, having reached the borders of its own limitation, assures us we can’t go there lest we should fall off the edge of the earth into an abyss. Whereas in actual fact, the concept of a greater conscious reality is no less valid than current scientific constructs of material reality. In fact, the essence of the universe as consciousness is just as valid a premise as the essence of the universe as matter. The only difference is that it can’t be perceived by the senses and scientific measurement. Why should that stop us? and humorous ways. One such story goes that he had lost the key to his house and that he was looking for it one night outside under a street lamp. A passerby asked him what he was doing, and he replied, “I’m looking for my house key.” Then she asked him where he’d lost it. “Somewhere inside my house.” So, quite naturally, she asked why, if he had lost it in his house, was he looking for it outside? “Because it’s dark inside,” he replied. We need to look for what we’re looking for in the right place! Even if it’s hard to look for it there. It’s easy to look outside. Not so easy to look within. According to yogic teachings, consciousness lies within. So we must look for it there. But here’s the catch. Not intellectually. It’s not something we can comprehend with the mind. Just as a lightbulb is capable of shining light on the room around it but not on the power that illuminates it, so too can we comprehend the world around us but not the consciousness that animates us. It’s beyond the normal functioning of the mind; beyond words; beyond even thought itself. The core of our being is not something that can even be spoken about, let alone thought of. Just because we can’t think of something; just because we can’t prove something scientifically; doesn’t mean it’s not there. We can’t prove the existence of a mother’s love for her child. But that doesn’t mean it’s not there. It’s a matter of the heart. And matters of the heart can’t be fathomed by the mind. So material science can never get to the heart of what it really means to be human. We can only validate the essence of our existence through the deepest internal experience of awareness within us. We need to restore faith in the possibility of a deeper awareness as the ultimate consummation of all our thoughts, desires and aspirations. That means an expansion of awareness: from our small self to a greater self; from our limited sense of awareness, our limited consciousness, to an unlimited, infinite consciousness. The more we will be able to attain that state of awareness (that realisation), the more we will feel that the essence of our own existence is the essence of all beings and all things. That we exist within, as part of, indeed as one with, an all- encompassing universal oneness pervading everybody and everything, within which the whole universe exists as an expression of that one universal consciousness. of a greater consciousness which encompasses the entirety of existence. That this greater consciousness is inherent in, controls, and is the essence of each and every particle of this entire universe. And on a personal level, I am furthermore convinced that the only way to attain complete and permanent fulfilment is to realise that higher consciousness as the essence of one’s own consciousness; to identify with it as the core of one’s being; as the self of one’s self; to make the deepest connection with it so as to be able to experience that which we are all searching for in the depths of our hearts: the deepest love; infinite happiness; perfect peace and contentment; bliss. To connect with our innermost sense of self; our deepest self; and be open to the possibility that it’s part of a greater self that encompasses everyone and everything. Be open to the possibility of realising yourself as that Greater Self. This process is sometimes known as devotion (or love for the infinite). It is the introversion of mind towards the one all-encompassing object of desire and fulfilment, rather than the extroversion of mind towards many limited and disparate objects of desire (and hence limited and disparate objects of fulfilment). Consciousness is the core of our being; the essence of our existence; the essential reality within which all things exist as a continuum of expression; a common thread with which the entire fabric of existence is interwoven. Our own consciousness is part of a greater consciousness which is the core of all being; the essence of all existence. What we are ultimately looking for is not outside us. It is within. In fact, it is more than that. It is us. We don’t actually have to find anything or be anything other than what we already are. We just have to realise the essence of our own existence; our deepest selves. We only have to realise ourselves as the Greater Self. 1. Health and hygiene (looking after ourselves). 2. Ethical living (looking after others and the planet). 3. Diet, which includes how we treat all creatures. 4. Service, in the same vein as ethical living, means helping others by giving of oneself without expecting anything in return. Our modern-day society is now waking up to the fact that it’s the giving rather than the taking that’s going to make the difference in the end: both personally as well as socially. Giving is indeed receiving. Studies have found that selfishness is not sustainable. Cooperation must supercede competition for sustainability. And that the immune system is physically compromised by selfish actions and strengthened by cooperative actions. That’s why it’s inevitable that we’re going to move from a corporate economy to a cooperative one. It’s only a matter of time. 5. Yoga postures prepare the mind for meditation by balancing the hormones and therefore the emotions. 6. Chanting also prepares the mind by withdrawing it from the things of the world and getting us into a meditative frame of mind, ready to enter the meditative flow. 7. And meditation. Meditation is the process of centring ourselves on our inner self; connecting to our true self. It is not the imposition of any belief from outside us. It’s about you. It’s about finding the essence of yourself within yourself and realising that essence as the inner self of all beings and the entire universe. of a field of consciousness vibrating with awareness and with bliss. It was so intense; so tangible, that I felt I could have cut it with a knife. It was undeniably real then, and I still have no doubt about it to this day. You can have many experiences like this during meditation, all leading to the realisation of one consciousness. You only need two things to succeed in meditation: The first is that you’ve got to have faith in the process, or at least give it a chance. And the second is that you’ve got to practice it sincerely. Close your eyes and take a moment to centre yourself. Focus on your sense of self. Feel the centre of yourself. Now feel that you are completely at peace. Feel peace and happiness all around you. Feel infinite happiness all around you. Now feel yourself merging into that infinite happiness. Feel that your own sense of awareness is merging into the infinite awareness around you. Feel that your own consciousness is merging into the infinite consciousness all around you. Feel yourself becoming one with it. Feel that you are one with it. Feel that you are it. Continue like that for as long as you like. You may have gotten a glimpse just now into the possibility of your own consciousness being one with the consciousness of the whole universe. That it is within us as well as all around us. That it’s real and that you can feel it if you really try. And not only feel it but know it as the core of your being. This is not just an abstract concept. It’s about the essence of us all. It’s about discovering the greater consciousness within our own consciousness; of realising our own inner reality as the greater universal reality. And the more we expand our sense of reality — our sense of being — the more connected we feel to all beings. The happier we are, the less fearful, the less lonely, because we realise that all is a part of us and that we are a part of all. The inner quest facilitates the embracing of the all within oneself: all people, animals, plants; the planet; people, animals and plants on other planets; the whole universe. Just as the world becomes a smaller place with the development of communication and transport technology, so too will the universe become a smaller place with the development of meditation technology! Through meditation we can rebuild the concept of consciousness as the one unifying factor of love and connectedness that will ultimately engender the greatest peace, contentment and bliss within us all and amongst us all. Dada Gunamuktananda trained in meditation, yoga, philosophy and natural health sciences in Australia, the Philippines and India. He has been a qualified meditation teacher of Ananda Marga (www.anandamarga.org) since 1995 and has taught meditation in Australasia, Europe, North Africa, the Middle East, the Far East and North America. 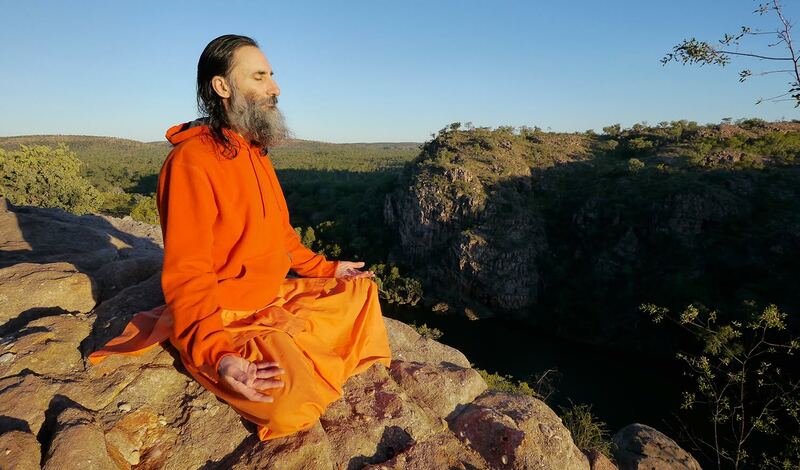 Dada Gunamuktananda Dada Gunamuktananda trained in meditation, yoga, philosophy and natural health sciences in Australia, the Philippines and India. He has been a qualified meditation teacher of Ananda Marga (www.anandamarga.org) since 1995 and has taught meditation in Australasia, Europe, North Africa, the Middle East, the Far East and North America. Hi Ver, thank you for reading. A very enlightening article indeed.